Length: 5 - 6 "
Habitat: Typically, mature deciduous forests; also mixed woodlands. Prefers forest edges or open woodlands. Diet: Insects and their larvae, such as leaf beetles, tree hoppers, ants, gypsy moth larvae, and tent caterpillars; spiders. In winter, seeds and mast. 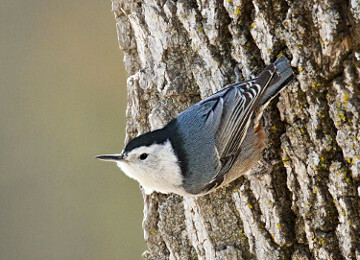 White-breasted Nuthatches favor black oil sunflower seeds, hulled sunflower seeds, peanuts (whole or hulled), and suet. They especially enjoy suet containing peanut butter.